Salem, OR—The Oregon Department of Veterans' Affairs (ODVA) and Confederated Tribes of Umatilla Indian Reservation signed a memorandum of understanding (MOU) at the Oregon State Capitol this week that will enable the tribal government to establish its first-ever tribal veteran service office. "As the daughter of a veteran, I know firsthand how critical the needs are for our service men and women and their families," said Governor Brown. "I am thrilled about this new partnership, which ensures the veterans of the Confederated Tribes of Umatilla will be able to access the services and benefits they have earned while serving their fellow Americans." The tribal veteran service will operate just like a county veteran service office, providing direct services to tribal veterans under ODVA's power of attorney. Like all county veteran service officers, the tribal veteran representatives (TVRs) will be trained and certified through ODVA. "We support tribal veteran service offices because we believe veterans are best served in and through their own communities," said ODVA Director Kelly Fitzpatrick, who signed the MOU with tribal leadership Tuesday morning. "Our veterans deserve the chance to work with service officers who understand their unique challenges, resources, and cultural identity. This is the vision behind our network of county veteran service offices, and the same is true, if not even more so, for our tribal veterans." Gary Burke, Chairman of the Board of Trustees, signed the agreement with ODVA on behalf of the Confederate Tribes of Umatilla Indian Reservation. "Our tribes, men and women, served in World War I, World War II, Korea, Vietnam, and the wars that are happening today," he said. "American Indians still believe that this is their country. And they are willing to put their lives on the line for this country. Thanks to these new services, more of our people than ever will have access to physical and mental health care and other benefits they have earned." The MOU will allow ODVA to legally assist TVRs in their pursuit of claims for disability compensation and pension benefits to the U.S. Department of Veterans' Affairs. ODVA will also be able to assist TVRs in filing appeals on any adverse rulings. The agreement helps ensure more tribal veterans are receiving the highest level of physical, mental and behavioral health care, with the support and assistance of federal VA's Office of Tribal Government Relations. "This partnership is a win-win for veterans," said Stephanie Birdwell, Director of the Office of Tribal Government Relations. "We are optimistic that collaborative partnerships such as the MOU between ODVA and Confederate Tribes of Umatilla Indian Reservation will inspire similar agreements elsewhere. Veterans will be able to work with local, trusted, TVR, and will not miss out on the benefits and services they earned through their service to America." 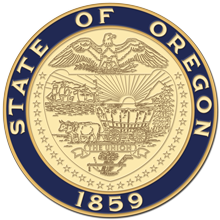 This is the second tribal veteran service office to be established in the state of Oregon. The first was created through a MOU signed with the Confederated Tribes of Warm Springs last August.